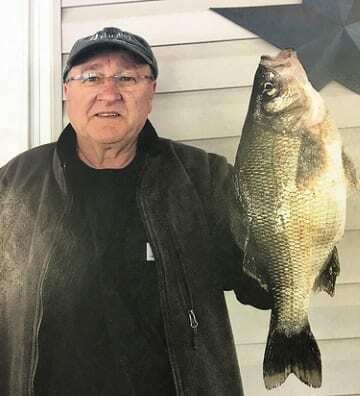 The Maryland Department of Natural Resources confirmed a new white perch non-tidal state fishing record was set on Friday, April 7th. George Venker of Baltimore caught a white perch weighing 1.9 pounds at Loch Raven Reservoir in Baltimore County. The retired Bethlehem Steel worker said he fishes at the reservoir regularly and used a bottom rig and a nightcrawler to bring in his record catch, which measured 14.75 inches in length. His historic catch broke the previous record of 1.6 pounds held by James Stiars of Bel Air since August 2016. Venker’s record perch was weighed on a certified scale at seafood wholesaler Mr. Fish Inc. in Baltimore. Natural Resources biologist Erik Zlokovitz officially confirmed the species. The department maintains state records for sport fish in four divisions – Atlantic, Chesapeake, Nontidal and Invasive – and awards plaques to anglers who achieve record catches. Fish caught from privately-owned, fee-fishing waters are not eligible for record consideration. Anglers reporting a potential record catch should call 443-569-1381 or 410-260-8325. The fish should be immersed in ice water to preserve its weight until it can be checked, confirmed and certified.